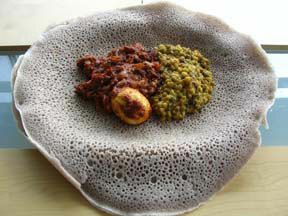 Ethiopian food – she eats. I finally got around to writing up Blue Nile after eating there two weeks ago with some fellow Chowhounds. Sure, I’ve eaten there before — I’ve even written about it here at she eats. — but I decided to give it the Houstonist treatment and, hopefully, introduce a wider audience to the gustatory pleasures of Ethiopian food. Caveat: that’s not a picture of the actual food at Blue Nile. My camera was on the fritz that day (quelle shock, I know!) and I managed to find a photo on Flickr that looked very close to Blue Nile’s food. Thank you, Creative Commons license! If you’d like to see some pictures from that afternoon and some pictures of the food we actually ate, head over to Food In Houston, where anonymouseater graciously put up a slide show of our meal.